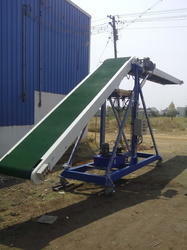 Our company has set the benchmark in offering Stacker Conveyor to the clients. Stacker Conveyor offered comes designed and developed in quality construction finish and supports stacking material like bagged flour, feed, fertilizer, cement. This Stacker Conveyor is easy to use and is widely used in different industrial applications. Moreover, customers can avail these products from us in a variety of sizes, dimensions, and hardness as per their needs. We are well-equipped with highly advanced facility and resources, which enable us to manufacture a wide range of Bag Loading Belt Conveyor. The special purpose conveyors that we bring forth for clients are known for their capability of efficiently handling a wide variety of materials in both vertical and inclined applications. Looking for Bag Stacker ?